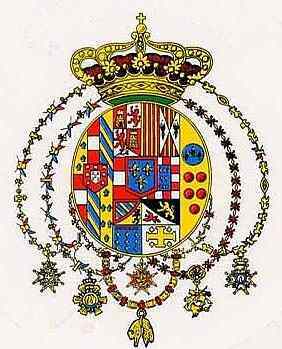 Although individual, the coats of arms displayed on an appropriate flag often came to symbolize the state itself, as is the case with the coat of arms of the Kingdom of Naples, also known as The Kingdom of Two Sicilies. The Neapolitan branch of the House of Bourbon was the last dynasty to rule Naples before its incorporation into a united Italy. The Bourbons ruled from 1735 to 1860, except during the Napoleonic interlude. The coat of arms of the Kingdom of Naples displays various historical connections between the Neapolitan Bourbons and other European nobility. For purposes of this description and with intense apologies to specialists, I shall dispense with the obscure vocabulary of heraldry. Looking at the coat of arms, you see that the shield is divided, vertically, into thirds. In the left-hand third are the arms of Farnese consisting of blue fleurs de lis on gold. This three-pointed stylized flower, based on the lily was the symbol of the French Bourbon dynasty. The lower part of the center third is "quartered" and shows in the upper-left quarter the diagonal stripes of ancient Burgundy with the black lion on gold of Flanders; in the upper-right quarter are the golden lion on black of Brabant and the red eagle on silver of Tyrol; the lower-left quarter represents the Sicilian House of Anjou with golden fleurs de lis topped by a red lambel; the lower-right quarter shows the golden cross on silver of Jerusalem flanked by four other small crosses. The right-hand third of the shield is the simplest. It shows the arms of Medici: a gold field with five red balls and a blue upper bigger ball on which are displayed three golden fleurs de lis. There is, indeed, a modern Bourbon pretender to the throne of Naples —Prince Ferdinand, Duke of Castro. He resides in France with his wife, the Duchess of Castro, the former Countess Chantal Frances de Chevron-Villette. There is even a Neo-Bourbon Society in Naples, which exists, according to their literature, not to restore the Kingdom of Naples, but to get southern Italians to appreciate their history. In 1999 they held a small demonstration in the historic center of the city to commemorate the Bourbon counter-revolution that defeated the Neapolitan Republic in 1799. More recently —and mundanely— they even held a Miss Kingdom of Two Sicilies beauty pageant! Also, see the entries about Naples under the Bourbons: (1) , (2) and (3) as well as the other "Bourbons" items in the subject index.